Welcome to Raft, a really minimalistic game where you build... a raft. Using this raft, you must get to the end of the level. Use the pieces found on the red shelf to build your raft. Any unused pieces should be left on the shelf. You must click on the player before you press the simulate button or the camera will not follow him. 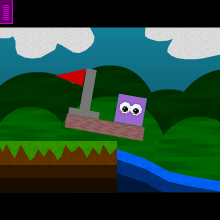 If the player is inside of the green section (appears at the end of the level), you win the level. Try to build the raft as close to the red transparent line as possible. The player cannot go through this line.